VICTORIA, British Columbia, Canada, September 8, 2010 (ENS) – Concern for the survival of albatrosses, penguins, and other marine birds has drawn scientists from 40 countries to first World Seabird Conference in Victoria. The five-day event opened Tuesday, sponsored by 26 professional seabird groups and societies from around the world. 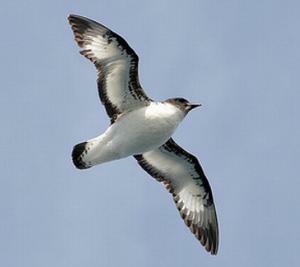 “We hope to close the meeting with an announcement that we have formed a new international governing body to address and collaborate on seabird monitoring and conservation,” said Professor John Croxall, chairman of BirdLife International’s Global Seabird Programme, a conference co-sponsor. More than 800 participants, including most of the world’s seabird scientists, are gathered at the Victoria Conference Centre to explore ways to help seabirds survive and enjoy a film festival and seabird art exhibition. Dying at a rate of around one every five minutes, albatrosses are becoming threatened faster than any other family of birds, according to BirdLife, a global partnership of conservation organizations based in Cambridge, England. Eighteen of the 22 species of albatross are globally threatened with extinction, an increase from just seven species in 1994. 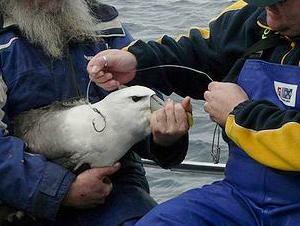 By far the greatest threat faced by albatrosses is death on hooks set by industrial-scale longline fishing vessels. But seabirds are facing the impact of oil spills as well as pollution, destructive fishing practices and climate change. Island breeding species are suffering from the impact of invasive species. 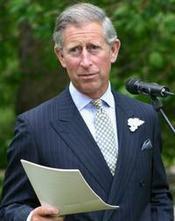 Prince Charles urged action in view of the fact that 97 of the world’s 346 species of seabird are now in danger of extinction. “That they face such challenges to their continued survival is, frankly, terrifying,” he said. To promote the mitigation measures BirdLife International and the Royal Society for the Protection of Birds in 2006 formed the Albatross Task Force – the worlds first team of dedicated instructors to demonstrate the correct use of mitigation measures to fishermen, and to develop and test new measures. Teams were initially established in countries with the highest conservation priority in terms of seabird bycatch and those countries which had solid BirdLife links and support structures in place. The initial teams were established in South Africa and Brazil. This approach has had success. In South Africa four years after the task force began its work with fishermen, for every 100 seabirds previously killed in fisheries, 85 birds now are being saved. The Albatross Task Force is now active in seven countries and plans to extend this success across the Southern Hemisphere and beyond. Delegates at the conference will learn how BirdLife has used its practical experience of working with fishermen to develop fact sheets detailing simple and inexpensive measures that can reduce accidental seabird deaths. 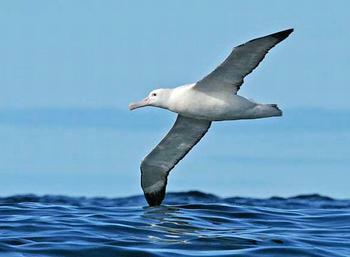 An intergovernmental conservation agreement was established in 2004 to address the survival needs of the world’s albatrosses and larger petrels. The Agreement on the Conservation of Albatrosses and Petrels has a grants scheme that invests funds in determining bycatch levels in priority fisheries and in developing promising approaches to bycatch mitigation. A paper, “”Working together to tackle bycatch,” describing the effort will be presented at the seabird conference. Challenges in both domestic and high seas fisheries include obtaining enough information on bycatch rates and gaining support for implementation of bycatch mitigation measures. The information gathered as a result of these grants has been used by Parties to the Agreement in their efforts to reduce bycatch and to develop specific plans of action in their Exclusive Economic Zones. Parties now include: Argentina, Australia, Brazil, Chile, France, Ecuador, New Zealand, Norway, Peru, South Africa, Spain, the United Kingdom and Uruguay. Ocean birds, shorebirds, waterbirds, and waterfowl that rely on saltwater habitat are at highest risk from BP’s oil spill in the Gulf of Mexico, according to the National Audubon Society. Audubon warns that since early July and through the next four months, tens of millions of shorebirds, waterfowl and other migratory birds will land on oiled beaches, in sullied coastal wetlands and on tainted waters of the gulf. “The Gulf of Mexico is like Grand Central Station for the birds of the eastern United States and especially the Mississippi Flyway,” said Audubon President Frank Gill.